According to the Current Population Survey (CPS) conducted by the U.S. Census Bureau in 2012, 35.3 million individuals moved within the United States. This increase in moves is an important component of pent-up housing demand. An individual is classified as a mover if the place of residence at the March survey differs from the place of residence one year earlier. In 2012, nearly 12 out of every 100 Americans moved. The share of the population that moved within the U.S. increased from 11.3% to approximately 11.6%. The 2012 estimate represents an increase of nearly four percent or 1.3 million more individuals moving over the prior period. However, moves remain well below the levels early in the 2000s when more than 14% of the population moved. The data shows the largest share of movers within the U.S. move within the same county at 66.5% in 2012. The share of movers within the U.S. moving to different counties within the same state increased from 17.4% to 19.2% in 2012. 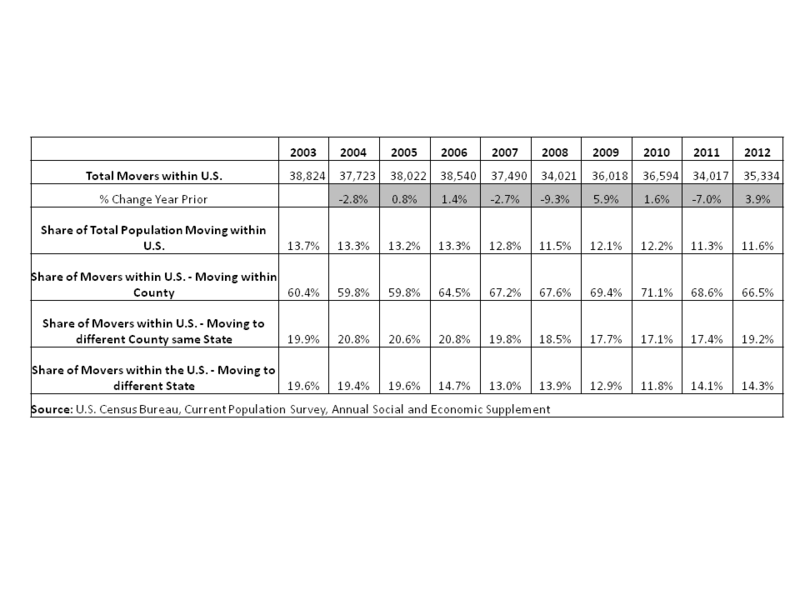 The share of movers within the U.S. moving to different states increased from 14.1% to 14.3% in 2012. According to the 2012 CPS, the most common reason for moving was to upgrade housing. 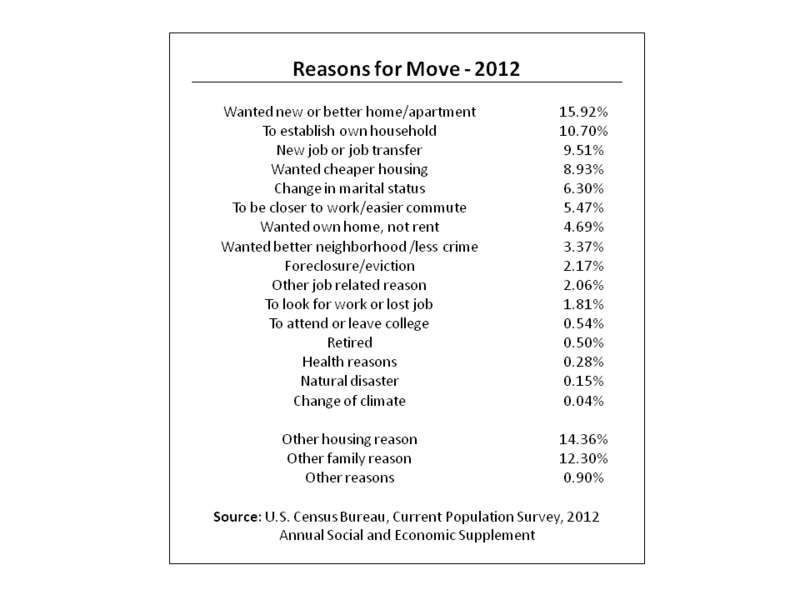 It is estimated that roughly 16% of those moving in 2012 did so because they wanted a new or better home or apartment. The next distinguishable category of movers at 10.7% did so to establish own household, followed by 9.5% moving because of a new job or job transfer. The fourth largest discernible category of movers, those moving to cheaper housing, declined for the fourth straight year. 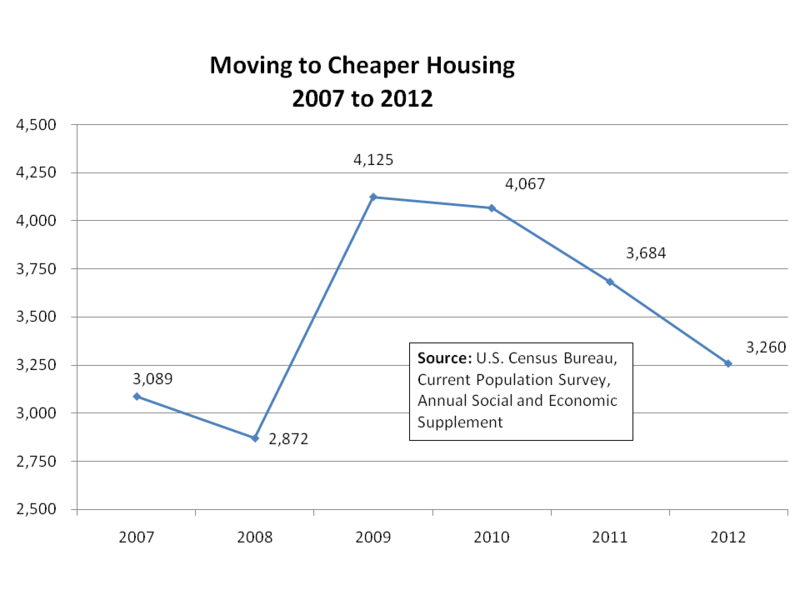 After hitting a high of 4.1 million in 2009, those moving to cheaper housing declined to under 3.3 million. Geographic mobility, the measure of how populations move over time, fluctuates from year to year depending on demographic and economic conditions. The high point came in 2006 when just over 38.5 million individuals moved. The total number of movers fell by 4.5 million to just over 34 million by 2008. The ability of individuals to move is important for a healthy labor markets as individuals move to better job opportunities. The ability of individuals to move is also important for a healthy housing market as individuals relocate to obtain housing that better fits their needs. Of course in recent years, some analysts have tied declining household mobility with negative home equity. Under this argument, individuals were essentially “locked-in” to property because selling would force the realization of a significant loss. Recent research by economists at the Federal Reserve challenges, in part, this claim. The Fed economists found that the combination of negative home equity and a household economic shock (such as job loss) boosted household mobility. In contrast, households with just negative home equity were found to have similar mobility rates as other households. Overall , the recent CPS data suggest household mobility is on the rise. The large increase in moves to different counties and the reasons for moving are promising for future home sales growth. This entry was posted on Tuesday, August 27th, 2013 at 11:26 am and is filed under Uncategorized. You can follow any responses to this entry through the RSS 2.0 feed. You can leave a response, or trackback from your own site.